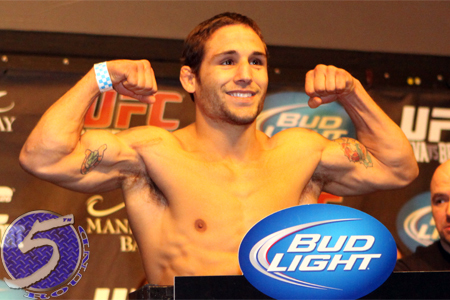 Chad Mendes (Pictured) is a 2-to-1 longshot to dethrone featherweight king Jose Aldo at UFC 142 in Brazil. Despite his underdog status and having to enter the biggest fight of his young career in hostile territory, Mendes feels as cool as a cucumber because “Money” believes he’s not the one sitting in the hot seat. “I think Jose has all the pressure on his shoulders,” Mendes expressed during a recent conference call. “He’s the one fighting in front of his home crowd. He’s the one who has the belt. I’m the underdog everyone is overlooking, and I’m confident that the things I’m good at are what’s needed to beat him. I’m feeling confident going into this fight. Mendes holds a perfect 11-0 resume and earned his top contender spot by hanging a convincing win over Rani Yahya at UFC 133 in August. While the Gambling Gods – and Aldo’s camp, for that matter – don’t believe Mendes stands much of a chance against the division’s most lethal assassin, Mendes is banking that his wrestling game will lead him to down championship lane. “The Aldo camp saying I am not ready for a title shot? They don’t know how good I am,” Mendes flatly stated. “They’ve never fought me or trained with me. I am very, very ready for this title shot. He has great takedown defense, but my type of shot is a blast-you-off-your-feet-type of shot. The HSBC Arena in Rio de Jenairo hosts Saturday’s fiesta. The featherweight affair will headline the pay-per-view broadcast.